Have you recently lost a pet? 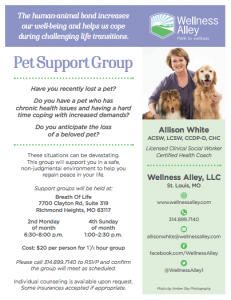 Do you have a pet who has chronic health issues and having a hard time coping with increased demands? Do you anticipate the loss of a beloved pet? These situations can be devastating. This group will support you in a safe, non-judgmental environment to help you regain peace in your life. 2nd Monday of month 6:30–8:00 p.m.
4th Sunday of month 1:00–2:30 p.m. Please call 314.899.7140 to RSVP and confirm the group will meet as scheduled. Individual counseling is available upon request. Some insurances accepted if appropriate.